The Deepcool Tesseract offers a bigger side window for better visuals. Its great compatibility, simple design and uncompromising cooling performance have made it a popular choice for many DIY enthusiasts and gamers. 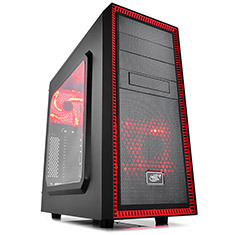 It comes included with 1x 120mm red LED front fan & 1x 120mm red LED rear fan, supports 310mm long graphic cards, Mini ITX, Micro ATX or ATX motherboards and CPU coolers up to 165mm in height. Backed by a 1 year warranty!